Here at Love-Live-Run we believe that our oceans should stay blue, our planet green and our soles dirty! We are a band of eco-loving outdoor nuts who want to change the world and introduce more people to the magic of the wilderness and play our part in its conservation. Angels and Demons – How To Conquer Hills! A Love-Live-Run Guide To Trail Running! Lululemon – Functional and Fashionable! Running in a winter wonderland! The 2016 UK and Scottish Ultra Trail Championships. Terrain – There was a lot of it. 90% varied trail and 10% road. Aid Stations – 5 in total with 4 drop bags. All fantastic! Race organisation – The best organised race I have ever been in. The logistics of organising such an event must have been some undertaking and the 180 volunteers were all absolutely fantastic. Atmosphere – I have never met so many funny people in my life… I couldn’t stop smiling the whole way round! The volunteers at the aid stations were so cheery and the fellow runners cracked bad puns and jokes all day. The people really do make this race! No litter was dropped at all on the trails either. Ultra people are awesome! I had been hunting for a good 50Miler to stretch myself a further and it was Fiona in our running club who spoke so highly of the event and after checking out the website and fantastic wee cheesy video my mind was made up. 53 miles, through some of Scotland’s most spectacular scenery. Who could say no? I have never been on any of that part of the West Highland Way before. It would be an awesome new adventure! I was not disappointed! 5:30am and the Milngavie train station is full. Nobody here is waiting on a train. The 700 ultra runners are excitedly jumping about keeping warm before the horn blows and they are set free to hammer through the town. Standing in our pens at the start, it all became very real. I had 53 miles to run over unknown terrain that had been described as “technical at bits” (we will get to that!) but it wasn’t a bad feeling, I could hardly hold back the excitement and so when the horn sounded me and Bruce fired off like excited puppies. Milngavie quickly falls behind and before you know it you are cresting a hill looking over some amazing countryside with the sun rising at your back. So like any Scots person, a hint of the sun meant t-shirt and shades on! Cruising into the first checkpoint and it was time for a quick loo stop and then off again! Things where starting to heat up now and the sunshine was fantastic! Special thanks to Johnny fling and all the volunteers for pulling that one out the bag! Again hammering into the Balmaha checkpoint I picked up my first yummy drop bag. Chocolate soymilk never tasted so good. The volunteers and crowd were fantastic, cheering us in, filling my water bottle and opening packets for me as I ate. You guys were awesome! 😛 so after a short munch I packed the rest into my bag and took off again along the path with Bruce. We started hitting rush-hour now as we passed by a lot of walkers and cyclists making their way over the west highland way. The terrain started out pretty flat but the further along the loch we got the more technical and the more undulating the path became. After more excited marshals and some super cheery crowd folk I hit Rowerdennan, had a quick munch and walked and ate my way into ULTRA territory. The final loch section was a tough section. The legs were getting heavy and there was a lot of climbing and technical terrain. Coming away from the loch you climb a steep hill are met with a fantastic view back over what you have just run. That really makes you feel epic! A quick change into my club vest and I downed a couple of gels, it was time for the final slog. The slog… This was a difficult section! My legs felt super heavy but I powered on, with encouragement from fellow runners. I ran a lot of the last leg with a lovely girl from down south (she won St Cuthbert’s Way I believe) who was great fun to run with and it was great to have a chat with her and her Fiancé’ on the bus! The closer I was getting to the finish the queasier I was starting to feel. I had taken to many gels at the last checkpoint and was not feeling 100% but luckily Bruce caught up with me and spurred me on to the finish were we ended together! What a fantastic finish! Running round the campsite and down the red carpet was a fantastic feeling with the bagpipes blaring and the crowd cheering you in. My Mum and Melon were waiting at the finish line for me and I felt super happy to see them! Medal on, more layers, more food, and a short nap later I was feeling grand! 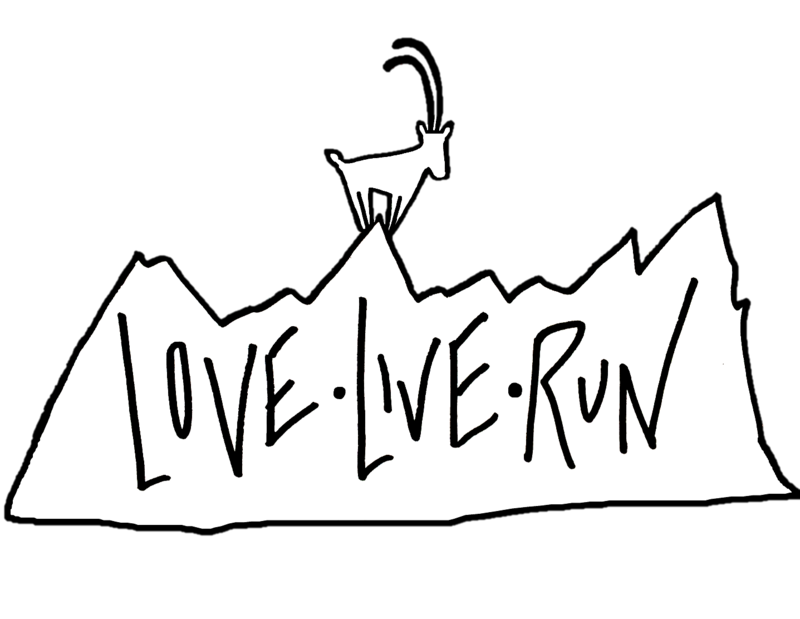 Love – Live – Run and get out and hit them trails!